The San Antonio Spurs drafted Tim Duncan first overall in 1997, and a highly profitable kinship developed almost immediately between Duncan and his fellow big-man teammate, David Robinson. The two low-post players were like brothers on the court, backing each other up and playing off each other’s strengths, but they looked most like brothers when they walked off the court with high-fives and arms wrapped around one another. In the image above, their physical closeness is indicative of their close-knit basketball friendship. Tim Duncan could not have been more fortunate than to join Robinson and the Spurs in 1997, and the Spurs could not have been more fortunate either. Robinson was the big brother who showed Duncan the tricks of the trade; Duncan was the over-achieving little brother who quickly stole the spotlight. 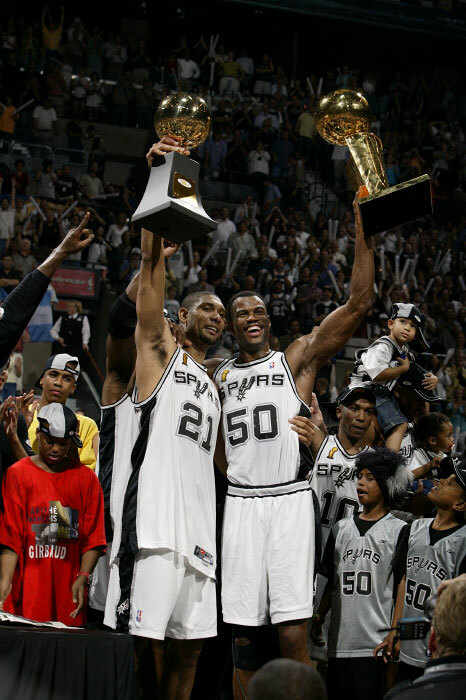 The image above shows their championship celebration in 1999, Duncan’s second season, as he holds his Finals MVP Trophy. When you stop to think about it, Duncan’s kinship with Robinson directed the trajectory of Duncan’s career. He entered the league as a team-first guy with loads of talent, but he skipped the growing pains of most rookies because big brother, “The Admiral,” was there to coach him along. In fact, the drafting of Duncan to join Robinson itself is an excellent example of the Spurs’ continued emphasis on an inside-out approach where the team is a family – where the players are like kin.